Hi, I am interested in your 2000 Chevrolet Camaro (stock #5104-CHA) listed on Autotrader for $16,995. I'd like to get more information about this vehicle and confirm its availability. This two-owner 2000 Chevrolet Camaro Z/28 has been cherished by its previous caretaker so well that much of this is still in survivor-like condition. 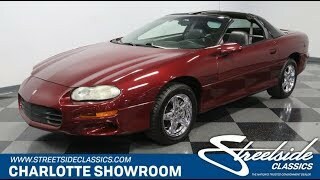 But considering this affordable classic offers the fuel-injected LS1 power mated to a six-speed manual, we know you wont be able to resist adding plenty to the odometer. Theres no mistaking a later fourth-generation Camaro with its sleek hood and updated front end that contributes to a very sophisticated appearance. This feeling is heightened further by the factory Monterey Maroon paint that gives you the passion of red, but with a more refined tone. And once the sunlight hits the metallic finish, the exceptionally preserved factory paint gives off a luster that will make you instantly understand exactly why this color was chosen. Of course, this shining example is also a performance machine at its heart, and you can tell by more than just those unmistakable Z/28 badges. Theres also a large integrated spoiler out back, and the blacked-out canopy gives it a purposeful look. And even if you do decide to keep this pristine Camaro for an investment, the T-tops will probably lure you out for plenty of starry night cruises. Step inside, and it feels like 2000 all over again. The carpets, door panels, and the dash are immaculate, and the back seats have never seen a childs sticky fingers. The black leather buckets in front are both grippy in the corners and the drivers one electronically adjusts to be comfortable for all-day drives. One of the reasons why this one is a good candidate to be a time capsule is because its loaded. That means power windows, power locks, dual airbags, cruise control, tilt wheel, and the factory premium Monsoon AM/FM/CD stereo. Best of all, the air conditioning keeps you cool even when this Z/28 is open to the world. If you decide to make a quick dash into the shops with the T-tops out and the windows down, dont worry about security, because this one also has a keyless entry anti-theft system. While we mentioned owing a later fourth-generation car gave you a sleeker front end, the true advantage of this is under the hood. The LS1 was the kind of small block that got all of us instantly excited from day one. More refined, lighter, and more powerful than its predecessor, it pushed the Z/28 past the 300 hp barrier. That kind of significance makes us happy to see the original numbers-matching V8 under the hood. But while you might marvel at how fresh it looks (averaging less than 3,000 miles annually,) we know youre not going to be able to resist taking it out for some fun. Thats because you have complete control over this powerful V8 and its thunderous roar thanks to the six-speed manual transmission. Plus, theres plenty of control with four-wheel disc brakes, power steering, ABS, and modern BF Goodrich gForce tires on the bright factory alloy wheels. The sale come complete with all the right paperwork, including the original window sticker, warranty card, owners manual, and maintenance records. This is the cool and collectable Camaro value youve been searching for, and now is the time to act because youre not the only one who can afford this T-top Z/28. Call today!! !